Can I Sue a Canadian Trucking Company in PA for a Trucking Accident? Home » The Law & You » I Got Into an Accident With a Canadian Truck. Can I Still Sue in PA? I Got Into an Accident With a Canadian Truck. Can I Still Sue in PA? A viewer had gotten into a trucking accident from a vehicle that belonged to a Canadian trucking company. Is it possible to sue the company in Pennsylvania? 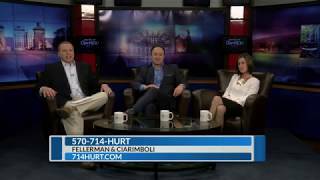 Truck accident lawyers Ed Ciarimboli and Molly Clark have the answer. Dave Kuharchik: It is time for “The Law & You,” featuring the area’s best attorneys. Ed Ciarimboli is here, so is Molly Clark for Greg today. Good to see you both. Ed Ciarimboli: People we’re emailing and calling demanding Molly come back on so here she is. Dave: She has a better smile than Greg. Molly Clark: He doesn’t have a smile. Ed: There’s no comparison. No comparison at all. Dave: Let’s get to our question today involving a truck accident. Mike from Hanover Township says, “I was involved in a crash with a Canadian trucking company. Can I still sue them in Pennsylvania?” What can you tell Mike? Ed: Mike, you can. We’re actually litigating a couple of cases involving Canadian trucking companies. As a matter of fact, I was actually up in Canada a couple of weeks ago taking depositions up there. I would be lying if I told you I know exactly how we have filed all this but Molly has been on the front lines researching this issue and figuring out what we need to do to file it. So I’m going to let her kind of run with it. But the short answer is yeah, just because they’re a Canadian trucking company. We can still sue them but I’m going to let the brains behind this operation tell you what we have to do. Molly: Eddie is giving me way too much credit. It’s actually not that hard at all. You can bring the cause of action in Pennsylvania, you can bring it in court. And the only hard part was we had to get some of the complaint language translated into French because it was a French Canadian company. So that was the only real hard part. So it’s simple and we’ll be happy to help you with that. Ed: And I don’t speak any French. No French whatsoever. Dave: Well you see, Molly, brings not only the smile but the brains. Ed: See? I told you. Dave: All right, results matter with attorneys Molly Clark, who’s here for Greg, and Ed Ciarimboli. If you need their help, check them out online or give them a call. We’ll see you guys again next time.